Oh Boy! A busy week. zwieracz has hopefully now played the Timeline Trilogy! The Renegadist mentioned that some of the content from Modificated seems to have been stolen from Paranoia. Can anybody conform this? How do you feel about stolen content. What should happen to the devs? Ballistic is a bloke – congrats to HIM. And Robotic Terrorist thanked me for pointing out how freaking realistic the RTB AK47 looked. White Light: The Unit 731 Complex: starts and stops! Nothing. No, seriously, nothing. But I’ll be adding some stuff tomorrow. Interloper, an online multiplayer real-time strategy game with matches that take only 5 minutes. Last week’s winner is announced in this episode via RandomCommentPicker.com. The game they won is The Stanley Parable. Both games are courtesy of Aaron from SteamContests.com. Check out his site for many more game giveaways. 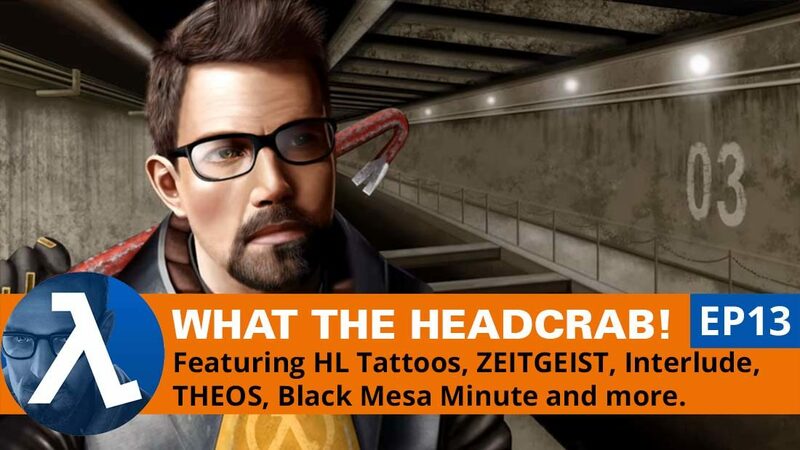 Valve said they would release Half-Life 3 once 100,00 have a special tattoo inked. For example, the tattoo was the new HL3 logo. Would you get it done? Show me your Valve-inspired tattoos. Off topic to finish, whilst looking for those HL tattoos, I came across the concept of single line tattoos and I was blown away – what a great idea! Until next time, remember, Finishing Half-Life is just the Beginning! No, not even if I was paid to do it. I view tattoos as unhealthy for the skin and a rather unnecessary unpleasant procedure. If Valve were to provide adequate customer support if I and 99,999 other people get their corporate media marked on our skin, that might make me reconsider my views on tattoos. I’ve changed my nick exactly because of what happened on the video. It’s unpronounceable in english. Oh boy and the raffle, I won! I thought only comments with “pick of the episode” phrase count, so I didn’t expect that at all. I think people look like a scrawled school folder with tattoos. BTW almost everybody has a piercing and/or tattoos today, so that is totally boring. Tattoos look silly. They make me wonder about the regret they’ll have when they turn 80, with sagging skin, and how depressing that would be to look at. If they don’t regret it before then, of course. Seems half the people I encounter have them these days, but like every trend, this too shall pass. About the “stolen content” from Modificated, yes, those are PARANOIA’s zombies, the mod’s author should have given the credits to the PARANOIA team or if it’s used as placeholder, specify it in the comments. For those who don’t know what a placeholder is, it’s an asset (model, texture, sound…) that you temporarily use for testing/showing purposes until you (or someone else) make an original final version. Let’s say that you are programming an AK47 for the Gold Source engine and you use Counter-Strike’s assets. If it’s for testing purposes, then it’s good. If it’s to showcase your work, you have to tell your public that CS’s AK47 assets are used as placeholders and they will be replaced by new original assets before releasing the mod. @Mod/maps makers : if you use an asset that you didn’t made as placeholder, please specify it if you showcase your work. If you are going to use someone else work permanently, look for the “usage conditions” (or licence) of the asset you are going to “steal”. If the asset’s author deny it’s usage in other projects, then please respect his/her wish. Otherwise, you might want to contact the asset’s author for permission and give the proper credits. Would Valve have to then authenticate every image of the HL3 inspired tattoos? As we are all aware a lot of content on the Web is fake, especially photography so they would want a note, maybe a statement from your tattooist? Regarding mod content. Using without permission is wrong, but some do not answer when permission is asked of them as their presence in the community has gone, so is it still wrong? Plus there must be an incredible amount of HL content floating about in the Net from lost modders and modellers. Artic headcrabs! There are those that would have a fit having something so wrong, so modified in a mod, just look at Leon’s “The Closure” page! Personally I would love the idea of fury headcrab zombies. Gordon and Alyx riding Tauntauns… so non, non canon! I loved the Half-Payne mod. Looks really cool. Also, that speed-drawing of Freeman is awesome. Kudos!! I would absolutely get a HL themed tattoo. In fact I probably will. I’ve been planning on it ever since starting to play Portal way back when. However mine will likely wind up being my modified Repurposed logo which features the mixture of the Armacham (FEAR) diamonds with Black Mesa’s circle, Aperture’s shutter, and the Combine’s points. I’ve invested a lot of time and effort into Repurposed, as well as the games it was inspired by. If they’d count that Repurposed logo toward a 100k tattoo number, I’d get it done literally as soon as I could get an appointment. What do you mean the 100k tattoo number? Not really 100,000 tattoos? And why wouldn’t it count?